The Rolls of Honour can be found in the Old Kirk, Glenbuchat. 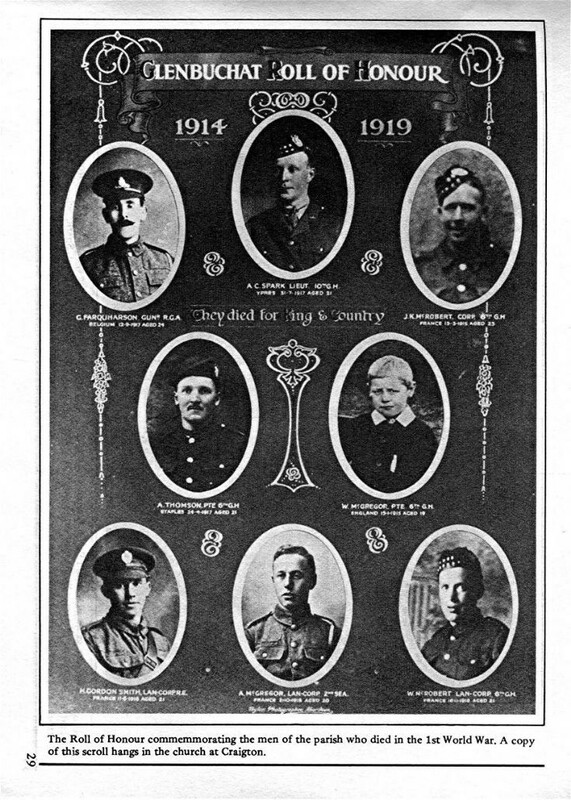 The first roll contains the names of the men from the village who gave their lives in World War 1, this Roll of Honour was in the church at Craigton but is now in the Old Kirk; each name is below a photo. Some detail has been taken from Volume II of Glenbuchat Yesterdays. The second roll of honour lists all those who served. FARQUHARSON George Gunner 98627, 352nd Siege Battery, Royal Garrison Artillery. Killed in action in Belgium 12th September 1917. Aged 24. Born Strathdon, enlisted Alford, resident Glebuchat. Son of Mr. and Mrs. James Farquharson, of Badenyon, Glenbuchat, Aberdeenshire. Buried in VLAMERTINGHE NEW MILITARY CEMETERY, Ieper, West-Vlaanderen, Belgium. Plot V. Row F. Grave 5. McGREGOR Alexander G Lance Corporal S/23013, 2nd Battalion, Seaforth Highlanders (Ross-shire Buffs, the Duke of Albany's). Killed in action in France 2nd November 1918 [memorial states 20th October 1918]. Aged 20. Born Glenbuckets (sic - Glenbuchat), enlisted Aberdeen. Buried in PRESEAU COMMUNAL CEMETERY EXTENSION, Nord, France. Plot/Row/Section A. Grave 3. McGREGOR William	Private 11225, 6th Battalion, Gordon Highlanders. Died in England 15th January 1915. Aged 19. Enlisted Alford, Aberdeenshire. Son of Alexander McGregor, of Upperton, Glenbuchat, Bridge of Buchat, Aberdeenshire. Buried in North-West corner of STRATHDON PARISH CHURCHYARD, Aberdeenshire. McROBERT John K	Corporal 10228, 6th Gordon Highlanders. Killed in action in France 13th March 1915. Aged 23. Born Strathdon, enlisted Glenbuchat. Son of the late Arthur and Annie McRobert, of Dulix, Glenbuchat, Aberdeenshire. No known grave. Commemorated on LE TOURET MEMORIAL, Pas de Calais, France. Panel 39 to 41. McROBERT, MM William Keir Lance Corporal 1165, 1st/6th Battalion, Gordon Highlanders. Died of wounds in France 16th November 1915 [memorial states 18-11-1915]. Aged 21. Born Strathdon, enlisted Alford. Son of the late Arthur and Annie McRobert, of Dulix, Glenbuchat, Aberdeenshire. ASwarded the Military Medal (M.M.). Buried in CONTAY BRITISH CEMETERY, CONTAY, Somme, France. Plot VIII. Row D. Grave 6. GORDON SMITH H	Lance Corporal, Royal Engineers. Died in France 11th June 1918. Aged 21. No furth er information currently available. SPARK Archibald Charles Second Lieutenant, 10th Battalion, Gordon Highlanders. Killed in action at Ypres 31st July 1917. Aged 21. Son of William A. Spark, J.P., and Isabella Ogg Spark of Glenbuchat, Aberdeen. Buried in WHITE HOUSE CEMETERY, Ieper, West-Vlaanderen, Belgium. Plot III. Row H. Grave 17. CEMETERY, Pas de Calais, France. Plot XIX. Row J. Grave 8. H(ugh) Gordon Smith was the illegitimate son of Catherine Fraser (daughter of William Fraser, tailor and Isobel Ross) and was born 8 Feb 1897 in Glenbuchat. Catherine subsequently married Alexander Smith in 1905 and presumably adopted H Gordon. He was serving with the "F" Special Company Royal Engineers and was Mentioned in Despatches. The Special Companies were engaged in gas warfare. More on H Gordon Smith. At Dockington in 1911 with Stepfather and mother.